Losing photos from an Android phone now has become one of the worst situations you might face. As the phones become better in aspects of the camera, so even those who are not keen on taking photos has become photographers. Photos now are being captured anytime and anywhere, and every bit of a photo keeps memories and data in it, and due to that, losing your photos has become a non-favorable situation at all. In today’s article, I will try to explain four effective methods for different situations to restore deleted photos from Android. If you have lost some precious photos and want to recover them, keep following the upcoming lines. Our Gihosoft Android Data Recovery Software provides you with the ability to recover all the files you may lose within a few clicks on your computer screen. With it, you can recover Multimedia files, Database files, and even WhatsApp and Viber conversations. Besides that, this Android photo recovery software is free to use and supports almost Android phones from almost all manufacturers. What distinguishes Gihosoft Android Data Recovery Software is not just being a free professional Android photo recovery software, but its ability to recover deleted photos without previous backup, which means that it will be the right choice when the problem happens. First: Download and install Gihosoft Free Android Data Recovery Software. Second: After launching the software, click on Gallery under Multimedia section. Fourth: Click on Start after connecting your phone, and Gihosoft Free Android Data Recovery software will start scanning your phone. 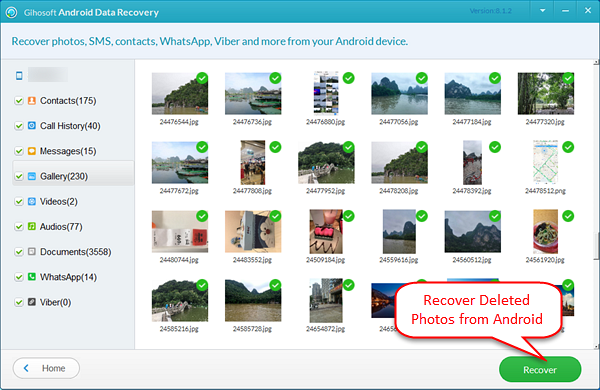 Fifth: After finishing the scan, start selecting the deleted photos you want to recover, and then click on Recover, to recover deleted photos on Android. The software will then start the process of recovering your deleted photos and videos you’ve selected, and you will find them all in your gallery. One of the best features on Android is that it stores all the photos in Google Photos for 60 days, so you can recover them all if you haven’t emptied your Recycle Bin. Note: This method works only if you’ve enabled Back Up and Sync photos on Google Photos app. First: Open Google Photos application on your phone and click on the three dashes on the top-left corner of the screen. Second: Click on Trash to go the Recycle bin-like on the app. Third: Select the photos and videos you want to recover. Fourth: Click on Restore, and Google Photos will restore all selected multimedia once you click on Restore. Note: You can also recover photos using Google Photos via PC by going to this link and login then follow the same steps as the phone. Google Drive is the cloud storage service that Google provides over the smartphones and PCs. 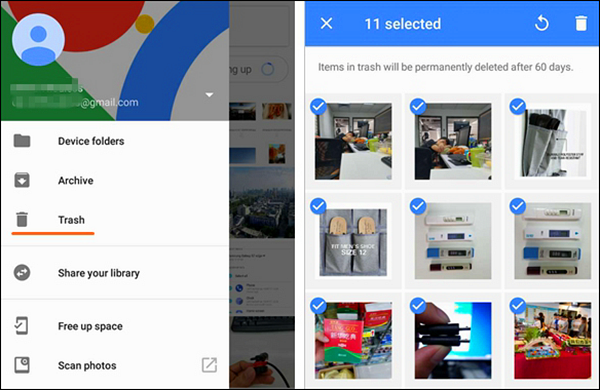 You can recover deleted photos using Google Drive by following the same steps as Google Photos. First, open Google Drive application, then click on the three dashes on the top-left corner of the screen and click on Trash. After going into the Trash, start selecting the deleted photos, videos, documents, etc. you want to recover, and then, click on the three vertical dots on the bottom-right corner on the screen. You will have three choices after clicking on the three dots, the first is Restore, to restore deleted photos and files, the second is Move, to move them from one folder to another, and the third is Delete forever, to permanently delete all the selected files you have selected. 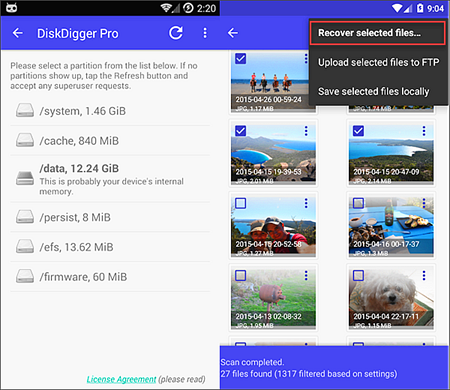 DiskDigger is another solution to recover deleted photos on Android. You can use DiskDigger whether your phone is rooted or not, while it has a feature called Deep Digging which performs a deeper dig in your phone memory to recover permanently deleted photos. After downloading the application, click on its icon, and then select the type of the scan that suits you; if your phone is not rooted, then select Basic Scan. Or you can perform a Full Scan in case your phone is rooted. After selecting the type of scan and clicking on Start Basic Photo Scan, start selecting the file types you want to scan for, whether they are JPG, MP4, PNG, MP3 or any other types of files with multiple selection function available. Once you click on OK after selecting the files types, DiskDigger will start scanning your storage for any recoverable files with the types you have selected before. After finishing the scan, you will be asked to select the files you want to recover, then click on RECOVER on the top of the screen. You will have three options to save deleted files, the first is to Save to an app like Email, Dropbox, Google Drive, etc. or to save them on Custom Location on your device storage, or to upload them to an FTP server. As we have seen, two of the previous methods depend on backing up and syncing your photos, and this is the best way to keep your data close to your hand when you need to recover it. There are many ways to backup photos on Android, but the best and what I recommend is using Gihosoft Mobile Transfer software. 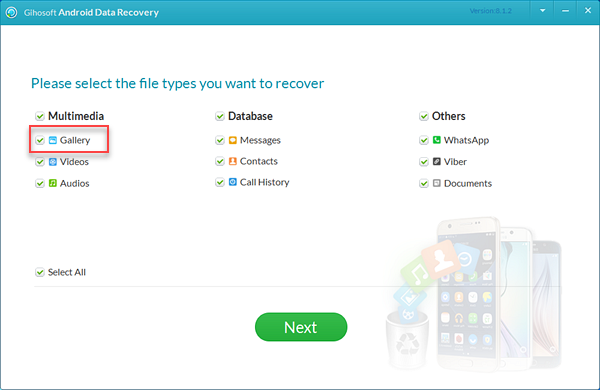 This is a free software allows you to backup all your data and recover them again whenever you want easily and safely without the possibility of losing any of them. 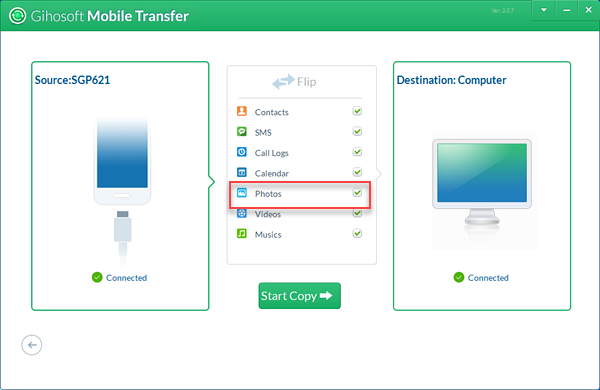 In order to do that, Open Gihosoft Mobile Transfer software, and click on Backup your phone, then connect your phone to the computer. Once your phone is connected to the computer, select the types of files you want to backup, and click Start Copy so the software starts copying your files and backing them up to your computer. Note: If you need to recover backed-up photos using Gihosoft Mobile Transfer, Open the application and click on Restore Data, then From Phone Transfer, and connect your phone. Select the file types you want to recover and click Start Copy. Now you have known how to recover deleted photos using four different methods in case you have a backup or not, and in case you have a rooted device or not. Also, you have known the best method to recover your photos and files over the computer using Gihosoft Mobile Transfer, which I highly recommend doing as it guarantees not losing your photos or files at all. Leave your opinion and experiences in the comments section below, and don’t forget to share the article with your friends and family to notify them about the importance of having a backup, and how to recover their deleted photos and files.